Considering going organic for your dairy products? Check out what local dairy farmers are in your area. 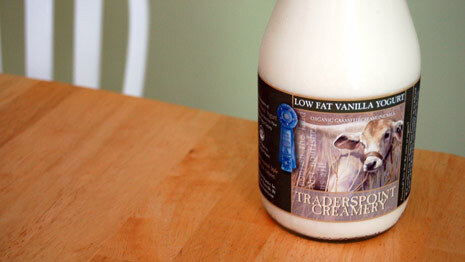 Traders Point Creamery is a family-owned artisan dairy that is not far from where I live. They provide organic, 100% grass-fed dairy products to local farmers markets, as well as select retail outlets. I recently had a lovely visit to their farm, and believe they have, hands down, the best yogurt I have ever tasted. This post comes on the heels of an article on CNN regarding the USDA accusing Aurora, one of the nation�s largest producers of organic milk, of cutting corners. Aurora, who supplies organic milk to places like Wal-Mart, Target and Costco, will now be under scrutiny for breaking the rules. So, next time you are going organic, I encourage you to look at local farmers instead of heading to the convenience of supermarket chains. And while you�re there, take time to stop and smile at the cows for me.